Looking at a blank canvas when starting a website can be pretty daunting. Where to begin? Usually you want to start with content. Once you have enough content ready to go, you’ll be all set to start the design process. But again, that blank page is still staring at you. You want the page to look appealing but also be easy to read, navigate and inspire action! 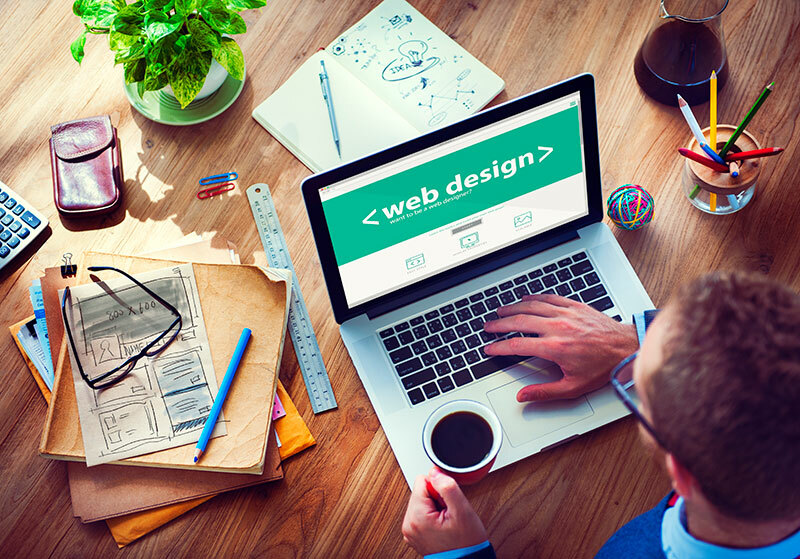 Here are some tips that will help make your site look inviting, cohesive, and easy to read. Websites are often put together in a rush without much thought behind the look and feel. Follow these tips and your site will stand out from the crowd. Very important. Figure out your design elements before you start typing anything onto a web page! You’ll save yourself a lot of time and frustration later. Images can tell your story in a way that your words can’t. They add interest and keep visitors engaged. But it’s extremely import to use a high-quality, appealing images. There’s nothing wrong with utilizing image banks like Shutterstock.com and Deposit Photos. You know the quality will be there even if they aren’t specific to your business. Most image sites allow you to download the images in a few different sizes, so pick one that approximates what you need. For a full width background image, go for at least 1280 px wide. In any case, you’ll want to optimize the for page load speed. Try to use .jpg files as much as possible, as .png files tend to be heavier and can cause slower page loading. Keep it simple. Select a dominant color (perhaps one from your logo) plus 1 or 2 accent colors. The accent colors can be used in headlines, subheads, button backgrounds etc. There are several different types of color schemes and ways of choosing them. A primary consideration should be your audience. You’re going to consider gender, age and interests when you look at a color scheme. Google fonts offers plenty of options and are the easiest to implement into just about any website. We recommend choosing one font that has enough options to give you flexibility throughout the design process — you’ll want the font to offer at least a bold and italic variation as well as regular or medium weights. Design and layout really go together hand in hand. Use headings, subheads and bold text to make it easier for people to pick out the important points of your message. Your content needs to flow logically and be pleasant to look at. Only then will visitors be drawn in closer to read you message. Use charts and diagrams if possible as well as images to add interest to your pages (and to explain concepts – a picture is worth a thousand words!) Another design aspect is to create a graphic element that depicts your message somehow, even if it’s just a swirl, a shape or a signature wisp of color that can be applied in backgrounds or as an extra touch of branding. Don’t be afraid to use white space – keep your sections separated visually. Too often web designers want to fill every space or push paragraphs up against each other. It’s ok if web visitors have to scroll a bit to see the message unfold down the page. White space is actually soothing to the eye and invites readers to move on to the next section. Don’t go too crazy though – you want to keep that flow moving. Put your most important content “above the fold”. When people first come to your site, they will be greeted by whatever you have place in the top half of your page, so make it count. Having said that however, you can’t put everything above the fold! Be objective about your messages. What is really the most important thing you want people to know? That goes above the fold. If your newsletter signup is in fact the reason for having your website, then put it at the top. But if you want to sell a membership or product and want visitors to learn more, you’ll want that above the fold, and your other signup forms below the halfway point on the page. Message + Audience = Design. When designing your site, you always want to keep your target audience and the message you want to convey front and center in your mind. How your site looks, “feels”, and reads will largely determine whether your site visitors are inspired to take action on your site, or hit the back button. Just put yourself in your customer’s shoes and imagine what would appeal to them. Let SubHub’s Speedy Setup Service make the creation of your website easy and fun. We’ll make sure your site functions correctly and looks good by working with you for 4-6 weeks. Contact us for details today.